Welcome to our Books Page. The books listed below are a general selection of books that are a great reference source for all items we specialize in. If there is a book you would like and don't see it here, Please call us at 801-808-0343 or use our Request Form and we'll get it for you at a 10% Discount. This single book outlines everything you need to know to get started in suction dredging for gold. In easy to understand language, supported by clear photographs and graphic demonstrations, this book covers all of the important information--including the legalities; where gold comes from and where to go find it; how gold forms into high-grade deposits; all of the different types of suction dredges that you will see in the field today and how they work; how to get the most from your own dredge's recovery system. Learn how to operate a suction dredge; how to sample for and develop high-grade gold deposits; the fundamentals of diving and dredging safety; rigging dredges on the waterway; how to complete your final clean-up and market your gold; and much, much more. Modern Gold Mining Techniques with Dave McCracken DVD The best video available on general gold mining techniques. Excellent footage on the formation of placer gold deposits. Panning, sluicing, dredging, fine gold recovery, and more, all clearly explained by industry expert Dave McCracken. If you only get one video on gold mining techniques, make sure this is the one. Very high quality footage. 90 minutes. One of the best books available on gold mining, gold dredging, and prospecting as a hobby or a small scale mining business. Covers the origin of gold, where to find it, recovery techniques, gold panning, sluicing, dredging, dry washing, hard rock mining, electronic metal detecting, cleaning gold, selling gold and much more. If you must own only one book on the subject, this is the one. Note: This book is the same as the previously titled "Gold Mining In The 1990's" but with a new cover and title. Fully illustrated. 8"x11" 279 pages. VERY LIMITED AVAILABILITY. Order below. Jimmy Sierra's latest gold detecting book covers everything about electronic prospecting and then some. Everything you ever wanted to know about detecting for gold but didn't know who to ask. Jimmy "Sierra" Normandi, 78 pages, soft cover, 5 1/2 x 8 1/2 inches. 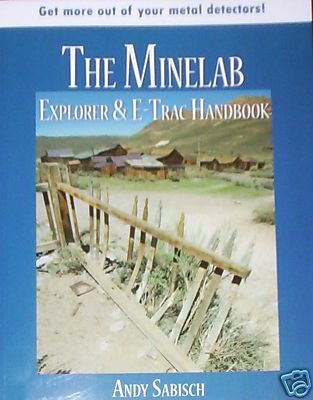 This book covers many aspect of hunting with Minelab E-Trac and Explorer detecors. Includes discussion of aftermarket accesories, all functions and more!! 188 Pages. Excellent illustrations. A "must have" for any new E-Trac owner. Copyright 2011 Something Old - Something New Jewelry & Coin. All rights reserved.